For more than a year now, big banks have been shafting their customers by refusing to raise interest rates on deposits and products like CDs - opting instead to use the added income to pad their bottom lines after nearly a decade of rock-bottom rates. This has been great for shareholders, who will indirectly reap the benefits of cheap financing costs and rising profits. Until recently, JP Morgan Chase & Co. had raised its average deposit rate by a paltry 0.21 percentage points, despite the fact that interest rates have risen by 1.25% since the cycle began. A sixth rate hike is widely expected when the Fed meets later this week. 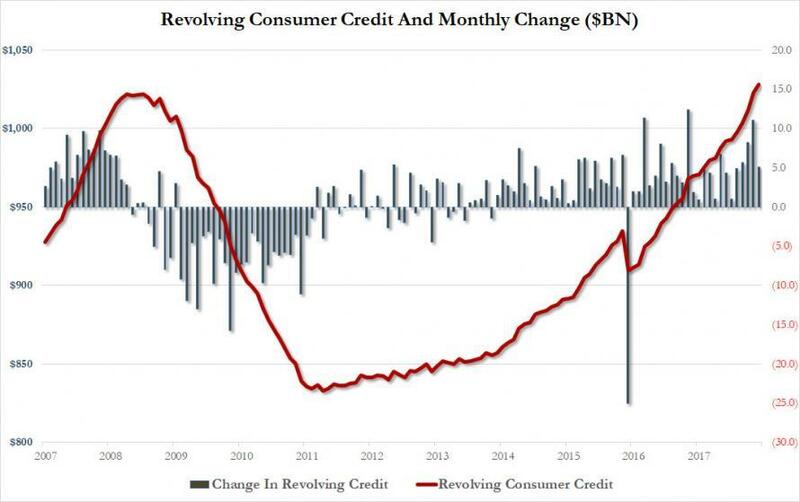 But until deposit rates catch up with the interest rates being charged by banks and credit card companies, consumers will continue to be squeezed as rising interest rates will make the record aggregate debt pile borne by US households even harder to service. In a glimmer of hope for consumers who have entrusted their savings to one of the country's largest banks (JP Morgan or Bank of America, for example), banks are beginning to raise their deposit rates ever so slightly, according to the Wall Street Journal. Case in point, the average rate on a one-year certificate of deposit climbed to 0.49% last week, according to Bankrate.com - its highest level in more than seven years. The problem is - as we pointed out last summer - the biggest banks won't feel compelled to raise interest rates markedly until they face pressure from the public to do so. Already, deposit rates have been raised for businesses and affluent individuals. But for the rest, near-zero returns have remained the norm. Banks over the past year have already raised the interest paid on deposits held by businesses and affluent individuals who demand it. But their tentative foray into higher CD rates is more about trying to get ahead of average customers’ demands. It’s a tricky calculation. Banks don’t want to pay more than they have to, but they also don’t want to keep deposit rates so low that customers eventually leave. "This is the biggest story that investors and bankers are going to talk about for the next two years," said Gerard Cassidy, an analyst at RBC Capital Markets, "after a period of eight or nine years of not even worrying about it." So why have banks have been so hesitant complacent to raise rates for the average consumer? Well, after a decade of near-zero returns, the average person simply isn't paying attention. A large chunk of the millennial generation has faced rock-bottom rates for most or all of their adult lives. It will take a long time, WSJ speculates, for consumers to adjust. However, some online lenders and smaller banks see low deposit rates as an opportunity to steal customers from their larger competitors. Ryan Easton, an IT consultant in Louisville, Ky., was tired of waiting for higher rates and recently switched from a local lender to Ally Financial Inc., an online bank offering more attractive rates. Mr. Easton, 30 years old, was hesitant at first and hasn’t been able to persuade his parents to follow suit. Overall net-interest income for US banks rose 8.5% in the fourth quarter from a year earlier, according to FDIC data, a quicker clip than the 7.6% increase in the year-ago quarter. Meanwhile, growth in banks’ deposit expenses has been unusually slow. Though the prospect of higher consumer prices (not to mention more burdensome debt payments) could soon break this cycle. This rate-raising cycle is different from the last one, from 2004 to 2006. Accustomed to a decade of ultralow rates, customers so far seem apathetic about chasing rates, even though technological advances have made it easier to move money. Gary Zimmerman, founder of MaxMyInterest, which matches bank customers with higher-yield bank accounts, said his clients tend to be uninterested in CDs. “If they want to lock up their money, they’ll do it in a way where they can get a higher return,” such as real estate, Mr. Zimmerman said. Higher consumer prices could eventually sway some customers to search for better deposit rates, said Greg McBride, chief financial analyst at Bankrate.com. When the Fed raised short-term rates in December 2015, the annual inflation rate as measured by the consumer-price index was 0.7%. In February annual inflation stood at 2.2%. Of course, many of these problems will be short lived. Because once the 10-year crosses the 3% threshold and volatility rears its ugly head, investors will retreat to the "safety" of cash and the Fed will face pressure to follow this up with another round of QE, and/or possibly NIRP, forcing consumers and corporations to pay for the privilege of lending to banks.